The first members of the church of Christ arrived in the area shortly before the turn of the 20th century. The church was formally organized in Shawnee for the first time in 1907. After meeting in various rented locations downtown, the building at 213 N Union was purchased in 1917 and became the permanent home of the small congregation. That building is now called the Stubblefield Chapel and may still be seen on the campus of Oklahoma Baptist University where it has been moved. The church grew rapidly while it met in the little white frame building and in 1920 was able to employ its first part-time minister. Central was still meeting at 213 N Union when the East Main congregation was organized and conducted its first worship service on June 25, 1939. Brother Floyd Perry, an elder at Central, preached the first sermon at East Main, and brother Perry Cotham, the minister at Central at the time, preached for the first gospel meeting. 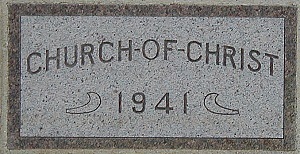 Central built its present building in 1941, and the first worship service was conducted on January 18, 1942. A new classroom annex was built in the mid-60's, and there was a major renovation of the auditorium in 1989 making it look as it does today. Central and East Main re-united as one congregation on September 27, 1992, and we rejoiced in the love, unity, and strength that were renewed at that time. Central has a rich history in the Shawnee area, shining brightly the gospel of Jesus Christ for more than 100 years. But, we will never be content to merely dwell on the past. Let us be encouraged to do more in the future. Let us invoke God's blessings on us as a congregation that we might be more worthy servants in His vineyard! In September 2003, Judy Hartley was going through her grandmother's things and found the program that was printed for the opening service of our building in January of 1942. This is an important document because it fills us in on some additional points of our history for which details were not fully remembered in recent years. To view this program, click here.